A group of explorers on an expedition through remote underwater cave system find themselves trapped after a tropical storm hits the area. Now stuck in a life or death situation, the diving team must work together to find way out of the undiscovered caves. "Sanctum" reminds me that when a talented and larger than life director stamps his name on a movie with a producer credit there's a chance it could be absolutely terrible. We all constantly flock to what we know and when a name like James Cameron is a huge part of the promotion, peoples ears perk up and naturally interest builds. Unfortunately this time around, you are better off avoiding Cameron's seal of approval. To be fair James Cameron is only a producer. He has however been a intricate aspect of the marketing and peddling of the 3D in the action-thriller. 3D technology that Cameron used in Avatar and to its credit, the 3D is pretty outstanding here. If I would have not seen this film in 3D my rating of this film would be even lower. The 3D and cinematography are the only aspect of the movie that work. They are the only things that create any remote sense of tension or fear in what is suppose to be a action-thriller. The cinematography by Jules O'Loughlin of the underwater caves is breathtaking and the stereoscopic 3D really is stunning in some of the dazzling underwater caves. The rest of the action-thriller simply is a mess. The script alone is a disaster. Penned by John Garvin and Andrew Wight the screenplay is weighted down with clunky dialogue and development that feel unnecessary to the main goal of the story. Without giving away too much, we have a father and son conflict that comes across awfully cliché and just slows the film down repeatedly. The screenplay is entirely predictable as well. A lot of blame can be solely placed on the use of foreshadowing at the start. A sequence that sadly makes the ending to the film plain as day. 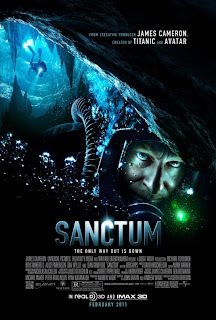 "Sanctum" is suppose to be a fear inducing action-thriller. We have a group of cave explorers or divers who are trapped and their only hope for survival is through the unexplored underwater caves. Each stroke and breath further down into the undiscovered system should be more and more terrifying, but its not. The movie is void of suspense, tension or fear for that matter. The film again becomes entirely predictable as we see the survivors one by one begin to turn on one another. Sadly you quickly realize that "Sanctum" is merely re-treading what we've seen numerous times before, only in 3D and not nearly as effectively as its predecessors. "Sanctum" is so bad you almost wish director Alister Grierson had pushed it more into the campy zone. You know had more fun with it. Allowed the actors to be a little more loose with the performances because the angle they went with did not work well at all. I've seen plenty of escape, disaster and underwater movies that have been able to blend paranoia and wit together just fine. Hell James Cameron has done it more than once, but alas we are not that lucky this time. Instead we must endure stale performances, a weighted script and misstepped direction.